Across the top you have the main menu providing access to various tools that can be applied to one or more customers or contracts. On the left-hand side, you have the Customers pane. 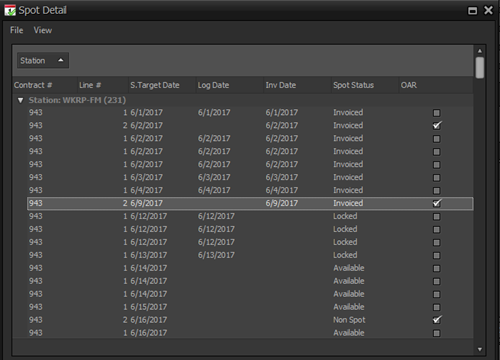 On the right-hand side, you have the contract/Projections pane. They are split by a Splitter Bar. Archived: Persistent toggle to show/hide Archived customers and contracts. See Archiver. Reset: Resets the view of both panes (modified using MyViews) to their factory-original state. Refresh: Refreshes the content (data) in both panes. EC Due to the Depth of the Contracts Documentation we have expanded these tools to their own pages. Pending Contracts: Contracts that have been placed within the system by Salespeople or other Station staff that have not yet been approved for airing. Make Goods: This provides a list of all spots that have been bumped from your Logs. In addition to Customer, SalesPerson and run dates the windows shows total revenue and count of bumped spots. From this list, you have the option of canceling/trashing any spots you do not wish to MakeGood. Check the box in the "dismiss" column next to the spots you wish to eliminate and then click the "trash" button that will appear in the bottom left corner of the screen. Print Confirmations: When approving a Contract and the Customer is configured to print Confirmations, the Contract goes into a queue to be printed; this window provides access to that queue so that you can print queued contracts. On the Left side of the Contracts window is the Customer Pane. This window lists all of your customers. It has columns that can be added/adjusted for personal customization. You can double-click to open the Customer window on any highlighted customer. Right-click to open the context menu. Some customers may or may not be hidden as Archived or Trashed (depending on what you have checked). Customer names can be displayed 3 ways, Fully lit-Active and running contracts, Faded-Archived or Faded with the line- Trashed. Archived: List # of archived contracts. See Archiver. Balance: The balance owed by Customer. Revenue Source: The RevenueSource entered on the Contract. Revenue Type: The RevenueType entered on the Contract. Sales Person: The SalesPerson entered on the Contract. Status: The current status of the Customer. Active: The customer is active. PrePay: This checks the default prepay checkbox. Warning: A contract made for this customer will flag a warning. On Hold : This Customer is on hold and you cannot make new or change contracts. Collection: This customer is in collections and you cannot make new or change contracts. Archived: This customer has been archived. (will show as faded). Trashed: This customer has been trashed. (will show as faded with a line through). This menu is accessed by using the mouse to right-click anywhere in the Customers pane. See Common UI Behavior. Open: Opens the highlighted Customer. See Archiver. New: Creates a new Customer. F1: Launches the help system (requires correctly configured web browser). Enter: Open the highlighted Customer. Del: Deletes the highlighted Customer. Ins: Creates a new Customer. CTRL+F: Find Contract using Contract number. CTRL+SHIFT+F: Find/Filter Customers pane using one or more words. Left Arrow: Moves navigation to the left pane (Customers). Right Arrow: Moves the navigation to the right pane (Contracts/Projections). Home: Moves the highlight to the top of the current pane. End: Move the highlight to the bottom of the current pane. F5: Refreshes the data in both panes. The contracts pane contains a list of all of the existing contracts related to the currently selected Customer (in the Customers pane). It has set of default columns that can be reset in the Main Menu. (see above). You can alter these columns to better suit your personal customization. From this pane, you can double-click to open the highlighted contract or right click to open the context menu. Status: The current status of the Contract. Pending: Not yet approved. Actions available are Modify, Approve, and Trash. Trashed: It was trashed before it was approved. Action available. Un-trash (which returns it to Pending status) (removes it from view unless the View trash is enabled. Aborted: An Approved contract that was canceled before it started running. Approved: When a contract moves from pending to approved all spots and off-air revenue is generated and available to be placed on logs and invoices. Running: At least one or more items are currently on a log or invoice. The only Actions available are Modify and Cancel. P.Cancel: This is a contract that has been canceled but at a later date. when this date arrives its status will change to Cancelled. Action available is Undo and Cancel. Canceled: Is a contract that has been canceled. Meaning all items that would have run from the date of cancelation forward are marked as trashed. This trashed item will not execute. Action available is Undo and Cancel. Paid: This is automatic. it's a completed contract where the balance due is zero. Action available is Archive. Start Date: The Contract effective start date (determined based on the Contract line items). End Date: The Contract effective end date (determined based on the Contract line items). G$: The gross revenue of the Contract. P.Conflict: The primary Conflict entered on the Contract. Estimate #: The estimate number entered on the Contract. Product: The product entered into the Contract. Billing Cycle: The billing cycle of the Contract. Canceled Date: The date the Contract was canceled. Comment: The comment on the Contract header. GE$: Gross Effective money for the contract. PrePay: A Column with checkboxes marked for prepay, unmarked for not prepay. Station: The Station or Stations that the Contract targets. New Button-Creates a new contract to the customer you have highlighted. Open: Opens the highlighted Contract. New: Creates a new Contract. Duplicate: Duplicates the highlighted Contract. Duplicate is very usual for creating modifications to a contract where you want to have different Invoices reflecting the change(s). Additionally, it is a useful tool for creating a new Contract well after the original has already completed; especially regarding situations where "re-orders" are common. New From Package: Creates new Contract from a Package. Create Package: Creates a Package using the highlighted Contract as a template. Cancel: Cancels the highlighted Contract... ASAP. Print: Prints the highlighted Contract as a Confirmation. Print Preview: Print previews the Confirmation of the highlighted Contract. Export: Exports the highlighted Contract to one of several available electronic documents. Split: Provides a tool to split the highlighted Contract on a billing cycle boundary. This is a snapshot of the revenue projection report for a 3 month period. A contract represents a unit of order that defines who, what, when and how much will eventually execute and ultimately bill. This window can be accessed from the Dashboard, Contracts, AR and Log. Across the top of the window, you have the main menu that gives you access to various features. The top half of the main part of this window are fields that represent the "header" of the contract. The fields in this portion of the contract are automatically populated (when creating a new contract) using the values specified on the Customer. The bottom half of the window contains tabs that show the contract line item(s) and the rotation(s). Save: Commits any changes made to the server. Print: Prints the contract as a Confirmation. Print Preview: Displays the contract as a Confirmation for review or printing. Spot Detail: This launches the SpotDetail window that displays the overall status of each item contained on the Contract. Approve: Approves the contract and closes the window. Cancel: Cancels the contract; can choose immediately or as of a date in the future. P.O. #: The purchase order number. Pre-Pay: Checking Pre-Pay allows the use of the Pre-Pay column in the Log Editor to identify clients that are of this status. Discount % (Optional): Provides the ability to apply an overall discount to the entire contract (on an Invoice-by-Invoice basis). Agency Commission %: This field is automatically populated using the selected Agency's default AgencyCommission. Secondary Conflict: See Conflicts. Now can be changed without Correction Mode. None: This is a special "billing cycle" that effectively disables any Invoice from being created and is meant for a contract that is a PSA, Promo, Bonus, etc. Calendar:The items on this contract will be automatically placed within a calendar month billing boundary; if the contract runs where the items cross over multiple months (calendar month billing boundary), multiple invoices will automatically be generated accordingly for each month. Broadcast: Similar to Calendar except on a standard radio broadcast billing cycle boundary. Weekly: Similar to Calendar except on a weekly billing cycle boundary which starts at the beginning of every Monday. End of Schedule: Regardless of how long the contract is running, Normally only one Invoice will be produced. If there is a mix of spots and OAR it will do 2 invoices. One with the spots and one with the OARs. This type of billing cycle is recommended for "short-run" orders. Begin of Schedule: Once this contract is approved, an Invoice is immediately produced and approved that can then be sent to the Customer for payment for the total of the contract. As the items execute, further Invoices are created (similar to the Calendar billing cycle) that are zero dollar and can be used a affidavit of performance. Begin of Schedule is ideal for handling Pre-Payments. CS It is possible to change this value after the contract has been approved using Correction Mode; however, extreme care should be taken when doing so as this completely removes any existing Invoices and recreates them based on the newly selected billing cycle. Any payments that have been applied will also be automatically reversed and will need to be manually reapplied after the newly created Invoices are re-approved. None: When selected, also automatically sets the Billing Cycle field to None; effectively disabling the creation of any Invoices for this contract. Detail: The default and most verbose of Invoice choices available; as much detail that can be provided is provided. Summary: Significantly reduces the amount of information provided. Time: Groups the items by time. Time/Rates - Groups the items by time and rate. The Detail, Time and Times/Rates Invoice types can also include the Affidavit or Notarized Affidavit texts as configured in Station. Co-Op Notarized Affidavit: This specialized Invoice type is very similar to Detail but includes a breakdown of each piece of Copy. CS Invoices can be further defined (what is included, how the information is presented, etc.) by using the options available in Group. When printing confirmations any contracts for a customer that share an estimated number will print as well. If you need to check if the said contract has other contracts linked to estimate number we suggest using Print Preview. If you have confirmations that need to be printed singly you can place an exclamation point (shift+1) at the beginning of the estimated number to break this link. Invoice Type can be changed without Correction Mode. TFN: Think of this as a reminder to identify a contract as being "until further notice"; this can be seen in the Contract report to help keep track of these types of Contracts. (Now A Legacy option). <priormonth>: The name of the month for the Invoice end date minus one month. <month>: The name of the month for the Invoice end date. <nextmonth>: The name of the month for the Invoice end date plus one month. The fields in the header (top half) of the window are automatically populated when creating a new contract using the defaults as defined on the Customer. These fields can be modified for circumstances where the default is not appropriate for the specific contract needs. When doing so, a blue informational glyph is displayed next to each field that does not match the Customer default value(s). The notes tab contains a single field that provides you the ability to enter notes that will only be seen by Users. This field is never included on Confirmations, Invoices or Statements. 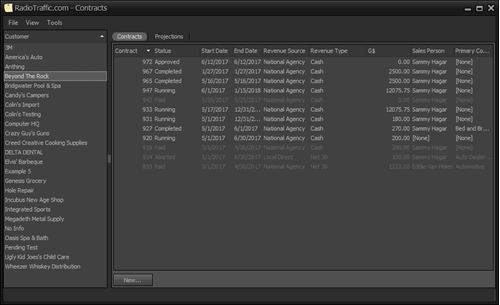 We have added a context menu to the Customer, Agency, Owner, Sales Person, Primary Conflict, Secondary Conflict, Revenue Type, Revenue Source, Avail Type, Credit Policy, Country, Tax, Tax-on-Tax, Fee, Voice, Sales Commission, Agency Commission and Category drop-down selection boxes throughout the application. Tools include Open and New. EC - I'm cycling through the Customer, Agency and Salesperson fields using TAB hotkey. I also leveraged the ESC hotkey to close window. One or more entries are entered in order to specify the number of units to execute and/or billing lines to be created. It has columns that can be added/adjusted for personal customization. Double click to open the Highlighted Spot/OAR. Right-click to open the context menu. Line: The number given to the line its in. Start Date: The start date of the spot/Oar. End Date: The end date of the spot/Oar. Rate - Rate per Spot/Oar play. Qty: Quantity, the amount of spots. Total: The amount of money its making. Comment: If there is a comment place on the spot/Oar. End Time: The time of day the spot/Oar runs to. Override Advertiser: A checkbox to notify if you have/have not overridden an advertiser. (can only see and do if you have an option on). Override Conflict: A checkbox to notify if you have/have not overridden a conflict. (can only see and do if you have an option on). Repeated: The setting on Spot/Oar daily or weekly. Schedule: The schedule of the spot/oar in days/week. Duplicate: Brings up a copy of the Spot/Oar as another line, allowing adjustments/alterations and ability to place as a new spot/Oar. Allows you to Cancel a spot or OAR immediately or at a certain date. Up Arrow: Moves the highlighted bar up. Down Arrow: Moves the highlighted bar down. This is a calculation summery (shorthand notation) of added/removed revenue, spots, and line item count. A Contract line item represents a sub-unit of an order that defines who, what, when and how much will eventually execute and ultimately bill. This window can be accessed from the Contract. The main body of this window are fields that represent the "line item" of the Contract. Some of the fields in this portion of the line item are automatically populated (when creating a new line item) using the values specified on the Customer. Save: Commits any changes made to the parent window (Contract). Placement Summary: This window displays the placement of the spots related to the Contract line item on Logs. 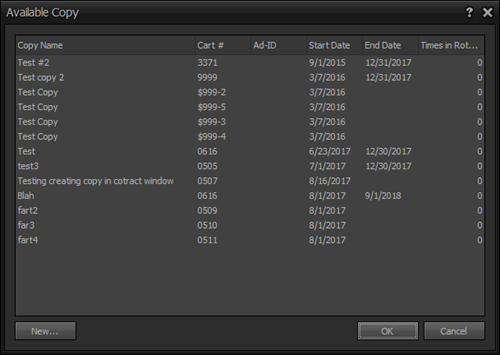 Invoice Summary: This window displays Invoices related to the Contract line item. Override start date: Provides the ability to "back-date" a line item; this is useful when entering a "write-on" Contract. Some fields of the window are automatically populated (when creating a new Contract) using the defaults specified on the Customer. These fields can further be modified for circumstances where the default is not appropriate for the specific Contract needs. Placement: The weight applied to spots related to this line item when scheduling side-by-side with other spots. The range is 1 to 10; 1 being the more weight (more likely to be placed prior to others). Rotation: Defaults to Automatic; however, can be modified to point directly to a particular (existing) Rotation. This significantly limits the flexibility related to scheduling and should only be done under very specific (in other words, very rare) circumstances. CS In order for a Rotation to be assigned, the rotations on the overall Contract must be saved first; you can do this by pressing the Apply button on the Contract window. This must be done in order to have the necessary "pointers" available for assignment. CS It is easier to state that you should avoid using this; if the circumstances arise where it becomes necessary to be utilized, it will be very obvious. This setting, in any case, is mistakenly utilized because of a lack of knowledge and experience in how the Rotation selection works and, when utilized incorrectly, can severely limit the flexibility offered and restrict your ability to quickly and easily make changes as Copy changes over the duration of a Contract. When in doubt, chances are you don't need to use this; to be sure, please contact customer service for advice. Start Date: The starting date for the "pattern" of units (spots) to be generated. End Date: The ending date for the "pattern" of units (spots) to be generated. Start Time: When scheduling these units (spots) on the Log, what is the starting time range that it is legal. End Time: When scheduling these units (spots) on the Log, what is the ending time range that it is legal. Length (Secs): Specifies the length of the units (spots) that will be generated. Rate - Specifies the amount associated with each unit (spot) that will be generated. Comment: Optionally enter a note to be associated with this line item. Weekly (Default) When creating a weekly based line item, the M-Su fields are provided so that you can specify how many units (spots) will be generated per encountered day of the week between the specified Start Date and End Date. The Skip Weeks field provides an easy means to generate a pattern for the first scheduled week and skip x week(s) before repeating the specified pattern. The summary below this section displays the total number of units (spots) and the revenue associated based on the line item Rate. Daily ★ When creating a daily based line item, the M-Su and Skip Weeks fields are replaced by a single Calendar button. The summary below this section displays the total number of units (spots) configured on the Calendar and the revenue associated based on the line item Rate. For further details regarding modifying the units (spots) configured for this type of schedule, see ContractLineItemCalendar. This allows you to apply an Off-Air Revenue to a contract. The main body of this window are fields that need to be set up before adding the OAR to the contract. Some of the fields in this window are automatically populated (when creating a new OAR) using the values specified on the Customer. Override Start Date: Overrides start date to be before the last locked log. The fields in the top half of the window are automatically populated (when creating a new contract) using the defaults specified on the Customer. These fields can further be modified for circumstances where the default is not appropriate for the specific contract needs. Start Date: Start date of OAR. End Date: End date of OAR. You can set the frequency of the OAR to fit your needs. Once: A use once single OAR. Once per Day: Daily Oar. ★ Feature not available in Essentials. Comment pane -This section is for your notes you want to see on invoices. Tab: Moves curser through all dropdowns in window. The rotations define how Copy is attached to the individual units (spots) when locking (approving) a Log. It has columns that can be added/adjusted for personal customization. From this pane, you can double-click to open the Copy Assignment window or right click to open the context menu. Items: The number of pieces of Copy in this particular Rotation. Length: The length of the Copy in the rotation (all Copy in a particular rotation will be the same length). Start Date: The start date that this particular Rotation is valid. End Date: The end date that this particular Rotation is valid. Start Time: The start time that this particular Rotation is valid. End Time: The end time that this particular Rotation is valid. Schedule: The days of week that this particular Rotation is valid. Sort_Order: The Sort order of the particularRotation. Right-click opens up the Context Menu. New: Opens up a new copy assignment window. CS The items are what define the number of units (spots) that can and will be scheduled. The rotations are leveraged by the Log to determine which Copy can be assigned to these units. Name: The name of this particular piece of copy. End Date: The end date of this particular copy. Percent: The percentage of use of that particular copy. Next: The copy you checkmark will be the first copy to be used when locking the log. EC This will rotate to the next copy down the list on every locked log. Open: Open the highlighted Copy. New: Creates a new Copy. Delete: Deletes the highlighted Copy. Duplicate: Creates a new Copy using the highlighted Copy as a template. The large up and down buttons located to the right of the Rotation list are used to move individual rotations up and down in the visible (sorted) list. The rotation list contains the All Day entry followed by the Lunch Hour entry. In this configuration, each and every time that a spot (on the Log) determines which piece of Copy to choose, it will always stop at the first item in the list since it is legal for the target date, time, station, etc. In other words, the second entry will never be evaluated because the first item is always found to be valid. The rotation list contains the Lunch Hour entry followed by the All Day entry. When the Log attempts to determine which piece of Copy to assign, it will test the first entry. Only on the days that are valid, the time that is valid ("lunch hour") and other criteria are met will the first item be found to be valid and utilized. If it is not valid, it falls through to the next entry on the list; which, in this scenario, would be found to be valid. Now, by default, the Copy will be assigned to spots using a default of a 1:1 ratio. No matter how many pieces of Copy you put into a rotation they will rotate evenly by default. If you want to rotate them in a manner other than evenly, you will need to set up the rotation so that the Copy you want to happen more often than the others is duplicated according to the frequency you desire. To assist in doing this, you can use the Rotation Ratio Editor. CS: This list is not, nor can be, MyViews enabled. This is because the order list of the rotations is of utmost importance because the determination of which Rotation can be utilized given a particular Station, length, date, time and day of the week is dependent on the order of the existing list. Use the large up/down arrow buttons on the right-hand portion of the list to move a highlighted rotation up/down accordingly. CS: It is important to keep in mind that in addition to all of the parameters that are checked regarding each and every Rotation in the list, individual Copy start and end dates are also verified. If no piece of Copy is valid in a particular Rotation, even if the Rotation parameters are completely valid, the Rotation is considered invalid and the Log will continue to the next Rotation in the list for verification. CS: Rotations can usually be modified at any time throughout the active life of a Contract. Individual Rotation items are only needed for current and future Logs; once a Log has been locked and there is no plans to reverse this, the individual Rotation is no longer necessary and potentially can be removed to reduce any possible confusion that may occur to having a large list of rotations. The Rotation Ratio Editor allow you to place Copy in whatever mix they need to be placed in your Contract. You will be able to move the Copy around in that rotation in any way you wish. Once the rotation is acceptable to you, click OK to save the rotation. CS You can edit rotation at any time; even after the Contract is approved. 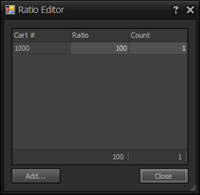 The Ratio Editor window has three columns (Cart#, Ratio and Count). The Add Button opens the Rotation Items window (see below). Right-click to open a Context Menu. You can left click on any of the Ratio column lines to change the ratio number. Open: Opens up the highlighted piece of copy. Remove: Removes the highlighted piece of copy. The Rotation Items window holds all of the Copy connected to that Customer. With this new "NEW" button, you will be able to create a new copy from within a contract. You can create a new copy like this from a Pending, Approved, Running, P. Cancel or a Canceled Contract. From this window, you can left click to put the highlighted copy into the rotation window. You can Right click to open the context menu. you also have the "Ok" and "Cancel" buttons in the lower right corner of the window. Cart #: The cart number. Copy Name: The name of this particular piece of copy. Start Date: The start date of this particular copy. Times in Rotation: The number of times that copy is in rotation. We understand that there are rare instances where it would be "simpler" if it were possible to directly assign a rotation to a specific line item of a Contract. In order to facilitate this, we are introducing the Activate "Complex Rotations" override. capability that can be enabled on a customer-by-customer basis. The ability to activate this capability is limited to the Administrator role; as this option should only be active for customers that have "extremely complex" scheduling scenarios. In other words, this override should only be enabled if absolutely necessary as there are sizable downsides in the form of restrictions and possible missing copy confusion introduced when utilizing this feature. Toggle the Activate "Complex Rotations" override. check box. When enabled for a particular customer there will be additional capabilities exposed on the Contract window related to rotations and saving it the drop down menu will have the valid rotations listed. In the above screenshot, you will see that we begin working with Contract that has a single line item. This line item is currently configured as a "regular" rotation; meaning that it will utilize any and all rotations within the Rotation tab in order to determine what Copy to assign when locking a Log. We decide that we want to hard-wire the first (in this case "only") rotation to the first (in this case "only") line item. CS - This would not be a scenario where we would do it this way... one line and one rotation is effectively already "wired". We want to draw your attention to the fact that the Rotation column is blank at the start of this process. We will then double click on the first line item to open it. Once open, you will see a Rotation field with a combo box containing (assuming you have at least one rotation on the contract) Automatic and Rotation #1. The default is always Automatic regardless if the "Complex Rotations" override is enabled on a customer. CS - Automatic is the recommended setting; use extreme care and caution if you decide to not use Automatic. We, in this example, are going to modify the line from Automatic to Rotation #1. Upon pressing the OK button to accept the change, you will see that the Rotation column now displays Rotation #1. Now that we've modified the contract to use Rotation #1 for line 1; the log will now ignore any and all other rotations on this contract when working to determine which copy to assign. CS - If this rotation and/or associated copy become invalid, any and all other rotations will not be reviewed/evaluated. Additionally, Rotation #1 will also no longer be able to be used by any other line(s) on the contract as it is "wired" to line 1 and cannot be used with any line that is set to Automatic. VR - If a rotation is assigned to a specific line it can only be used by that line. This makes the rotation assigned to the line invalid for general use of that contract. VR - If you create a new rotation it does not actually exist until you hit the Apply button so is not available in the rotation combo box. This window reflects the individual details for each and every item scheduled on a Contract and can be accessed from the Contract window by using the View->Spot Detail entry on the main menu. Across the top you have the main menu providing access to various tools that can be applied to the current view. It has columns that can be added/adjusted for personal customization. Print: Prints the current view. Print Preview: Print previews the current view. Station: The Station that this item targets. Contract #: The Contract that scheduled this item. Line #: The line number of the Contract that scheduled this item. Log Date: What Log is this item scheduled, if any. Inv Date: What Invoice date is reflected for this item, if any. Spot Status: Reflects the current status of this item. OAR: Whether or not this is an Off-Air Revenue item. A.Log Time: If this item has been reconciled, the time that it aired. Cart #: The currently assigned cart (Copy) number. Copy Name: The name of the assigned Copy. Inv #: The number as reflected on the Invoice for this item. Inv Status: The status as reflected on the Invoice for this item. Inv Time: The time as reflected on the Invoice for this item. L.Avail Type: The AvailType currently attached to on a Log. Log Open: A checkbox column to show if Log is open(Checked) orclosed (not checked). Log Status: The statue currently attached to on a Log. O.Target Date: The originally targeted AvailType. The rate of this item as defined on the Contract. S.Avail Type: What AvailType this item is supposed to target. S.Log Time: The target air time as defined by the placement of this item on the Log. This menu is accessed by using the mouse to right-click on any item in the list. See Common UI Behavior. Reschedule: Prompts for a new date ranging from the overall Contract start and end date to reschedule the item to another target date. Force Bump: "Bumped" spots are spots that, at one point or another, have existed on a Log (or been forced into a bumped status by using this tool). Force OAR: "OAR" are off-air revenue item(s) that have not yet been transitioned to an Invoice. Force Trashed: A "Trashed" is a spot or OAR that has been specifically flagged as "will not air/invoice" by a User. Force Invoiced: It is possible (and necessary under some very specific circumstances) to "bypass" the regular process of scheduling on a log, airing, reconciling and directly place a spot on an Invoice. These various tools are visible depending on User enabled roles and the current status of an individual spot/OAR. To "reschedule" beyond a particular Contract expiration, you will need to trash the spots on the existing Contract and create a new Contract to schedule those items into a new billing period. Just a cookie for coming all the way down here. Hope this page has helped in some form. As far as any added info. The kitchen sink in my house is a black, metal, 2-tub, under mount.